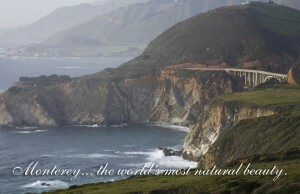 Day 1: Forbes, Falcon Guides, and Lonely Planet have all named Highway One as one the best scenic drives in the country. 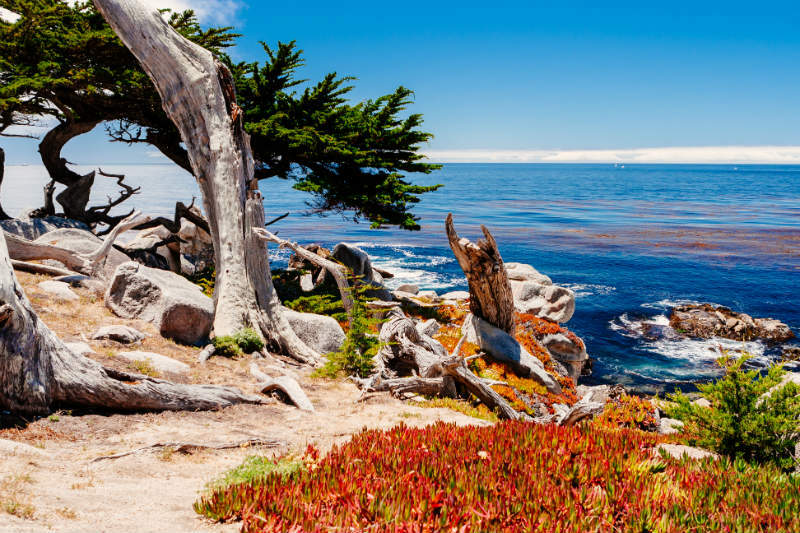 Trip Advisor boasts that the 17-Mile Drive is one of the top five attractions in Monterey, CA. 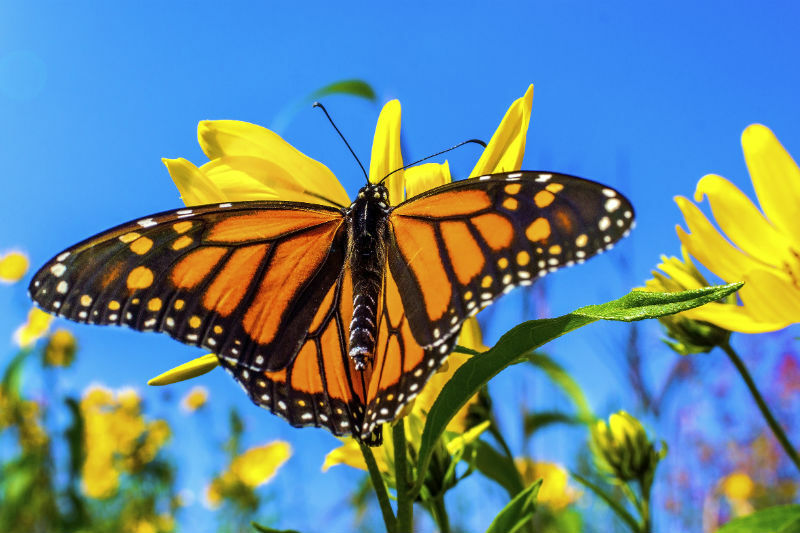 Along the drive just north of Monterey, you’ll encounter the Elkhorn Slough wetlands, the Moss Landing fishing port, artichoke fields galore, and giant sand dunes reaching to the beautiful beaches. 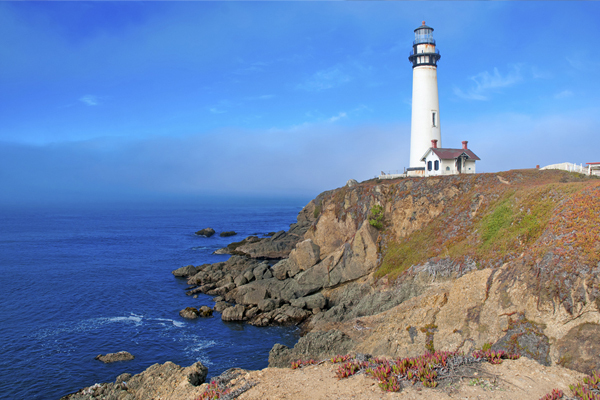 Continue a few miles south, and see gigantic Cypress Forests and the ruggedly spectacular Carmel coast line. Soon you’ll approach the giant stands of Redwoods and the bridges of the famed Big Sur country. Big Sur calls to every adventurous traveler with its grand beauty. Located in the heart of the Monterey Peninsula, our Monterey Bed and Breakfast is a perfect departure point for your drive along California’s beautiful Highway One. Day 2: Many of us know that the big Blue Whale is the largest mammal, but, even so, it’s nearly impossible to fathom the size until you’ve seen one up close and personal! 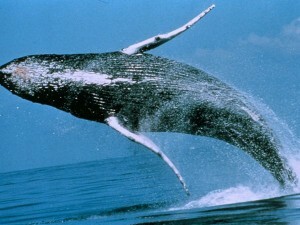 Whales can be seen year round here on the Monterey Bay. Right now is a great time for Humpback and Blue Whales, and coming through soon will be the Gray Whales. Some guests at breakfast recently mentioned they had seen a pod of Orcas out there too (yikes!). Start your expedition with any number of companies located on Monterey’s Fisherman’s Wharf. While we can’t guarantee the exact position of the whales, we can guarantee that at our Old Monterey Inn you’ll have a warm, cozy, welcoming place to return to after braving the sea all day, so see all your Monterey Lodging options at our award winning accommodations! Day 3: Our final suggestion for adventure during your visit to Monterey is Kayaking for two in the wildlife sanctuary at Elkhorn Slough. The water is calm, perfect for kayakers of any level! 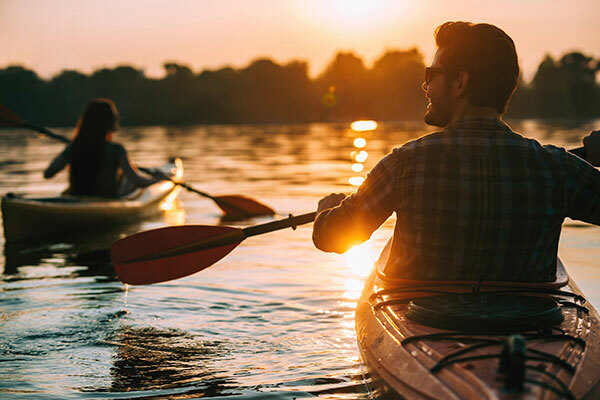 We’ll make sure you have what you need: kayaks, paddling orientations, wetsuits, paddle jackets, life vests, back rests, and a picnic basket with towels, fresh fruit, snacks, and drinks. Elkhorn Slough has such a wonderful day in store for you: sea otters playing in the water just around your kayaks and a whole ecosystem of birds—white-tailed kite, red-shouldered hawk, barn owl, chestnut-backed chickadee, and oak titmouse. Birders unite! Our Old Monterey Inn Specials include a kayak package, call us for more details. We look forward to welcoming you to our warm, cozy Old Monterey Inn, setting you off on the road of adventure, and hearing all about it when you get back! Just a two hour drive south from San Fransisco is the ideal location for the relaxing fall getaway you so richly deserve. If you like playing golf on championship level courses, tasting fine wines, eating at gourmet restaurants, attending fun festivals or exploring the natural beauty of the California coast, then Monterey is the place for you. And the best place to stay in Monterey to experience all of these iconic activities is Old Monterey Inn. Not only are the rooms luxurious and comfortable, but the expansive gardens and quiet neighborhood surrounding our Inn provide for a secluded and private feel, yet we’re just steps from restaurants and shopping. It’s a wonderful home base for exploring Monterey, Carmel and the Big Sur coastline. There are so many things that make this area special, and we’re always excited to celebrate them! It seems like the Monterey area has a festival for every interest. 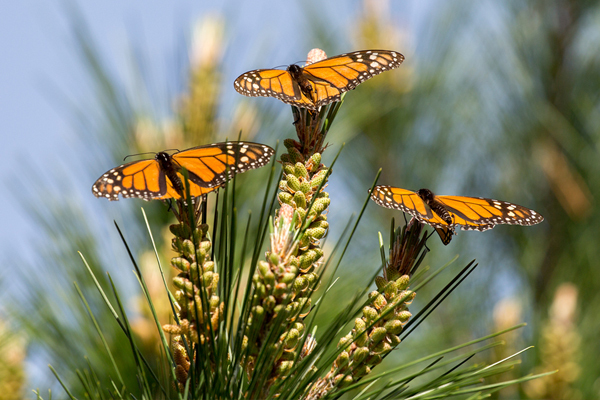 For nature lovers, we celebrate the return of the Monarch Butterflies with the Monarch Parade & Bazaar on October 6th. For auto fans, the Pirelli World Challenge showcases long distance GT racing at the world famous Laguna Seca raceway from October 26th-28th. For foodies and wine lovers, venture down the coast for the fantastic Big Sur Food & Wine Festival from November 1st-4th. For country music fans, we’ve got the 20th Annual Monterey Cowboy Festival on November 3rd, with a great musical lineup featuring Jon Pardi! And finally for the running enthusiast, join us in the Monterey Bay Half Marathon on November 11th, where you’ll get up-close views of the exquisite coastline from Monterey and Pacific Grove. Whether you’re planning to spend your days shopping in downtown Carmel, strolling down a local beach, or visiting the world famous Monterey Bay Aquarium, you’ll be happy to return for a relaxing treatment at our on-site spa in Monterey. We offer a variety of massages, facials, aromatherapy treatments and more for both singles and couples. Our professional therapists will make you look and feel your best before you head out for your evening on the town at one of the many fantastic restaurants near Monterey and Carmel. 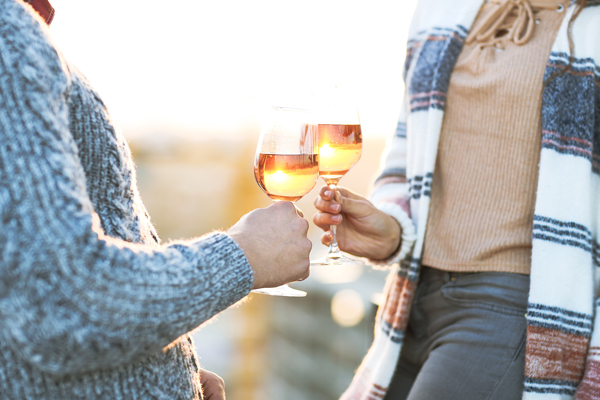 Wine Enthusiast Magazine has named Monterey as one of the “10 Best Wine Travel Destinations in the World” for good reason. We are home to over 55 tasting rooms and distinctly different wine growing regions. For a tasting tour that requires little planning, just hop on the Wine Trolley, they’ll pick you up just one mile from the Inn. 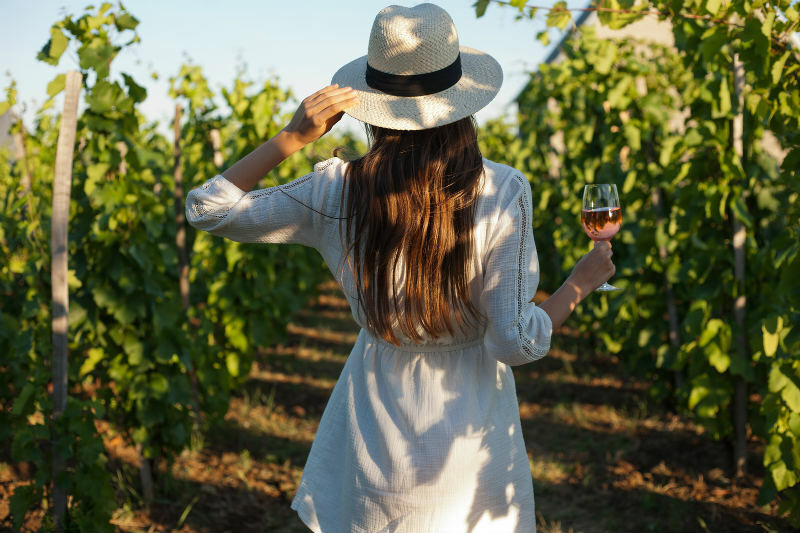 The Carmel Valley offers a classic wine tasting experience with country roads to explore in between stops, while Carmel-by-the-Sea has several tasting rooms within walking distance of each other so you can sip, and then stroll. Or you can get the VIP treatment and take advantage of our Chauffeured Wine Tour Package! No matter which you chose, be sure you buy a bottle to enjoy at dinner that pairs well with our area’s fresh seafood and incredible local produce. With our temperate climate, this season provides ideal weather for outdoor excursions. Whether you sign up for our Kayak Adventure Package, hit the greens for a round of golf, or venture south to Big Sur for a day hike, you’ll be pleasantly surprised at the comfortable daytime temps. 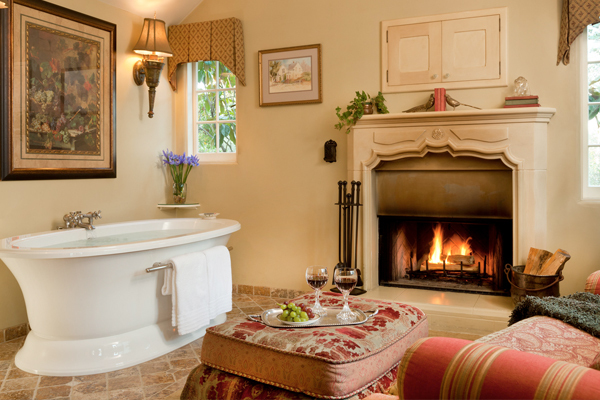 When you return in the evening from your active day, the mercury will drop just enough so that you can get cozy by the fireplace, which are featured in all of the romantic rooms at our Monterey bed and breakfast. Before winter sets in, make your way to the beautiful Monterey coast for a fun and relaxing getaway. Choose your favorite room with all of the luxury amenities needed to ensure an experience worth your time away. We’ll have the freshly baked cookies, hors d’oeuvres and wine waiting for you at our romantic bed and breakfast in Monterey. Now that you have fallen in love and become engaged, the next step in your happily-ever-after is a magical wedding. 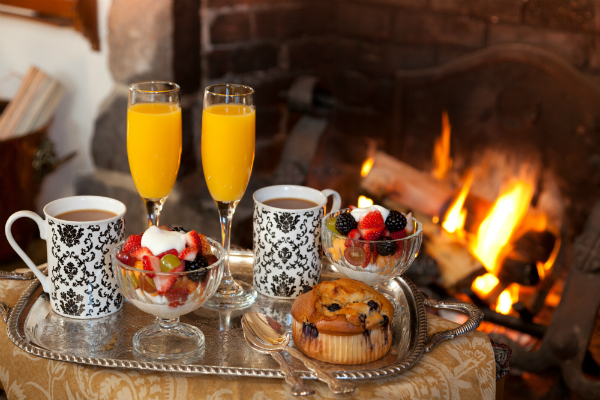 Let us help you celebrate your love and commitment to one another at our luxurious Monterey bed and breakfast. Our award-winning inn has earned national acclaim and was even featured on the Today Show as a romantic destination. So whether you’re imagining a private elopement with just the two of you or an intimate ceremony with up to 40 guests, we have the venue and package to make your special day unforgettable. Our glamorous estate provides the perfect backdrop for your intimate wedding or elopement. 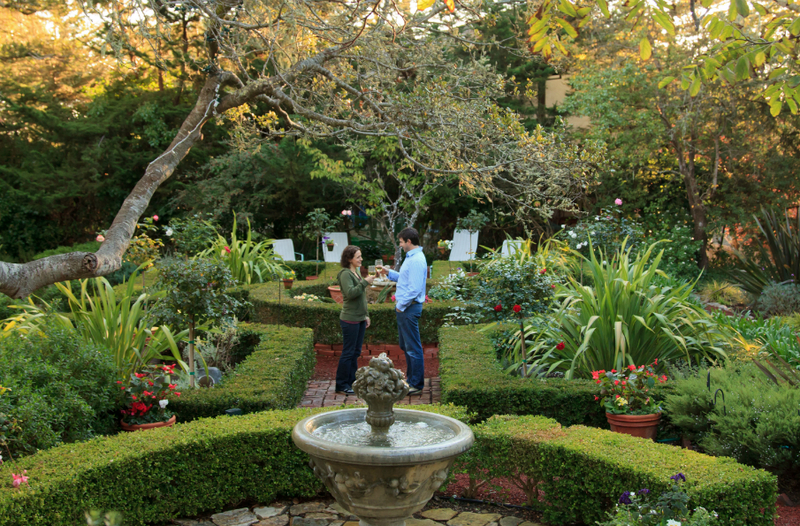 Nestled off the beaten path in the heart of Monterey, our peaceful Inn sits on over an acre of serenity. The estate features a whimsical garden that is reminiscent of a scene in a fairytale book, making it ideal for your storybook wedding. Age old oaks and majestic cedars watch over the formal English garden, complete with rose trees, fragrant lavender, vibrant flowers, and lively hummingbirds. Now picture just you and your best friend holding hands and delighting in your love for one other. When planning your big day, our experienced staff is here to give you suggestions regarding local vendors for catering, flowers, music, and any other detail you may have questions about. We are happy to to help you make your Monterey wedding everything you have dreamed of and more, so you can relax and savor every moment with your loved ones. Our unmatched wedding venue is guaranteed to create a memorable ceremony. For an intimate ceremony for just the two of you with no distractions and no stress, we have handcrafted the ultimate Elopement Package. This package includes two nights for the special couple in our best available suite at the time of check-in. We will provide a full day of wedding coordination and an exclusive ceremony in our captivating garden. You will also receive Champagne, engraved flutes, daily gourmet breakfast, evening wine and hors d’oeuvres, concierge services, and all our deluxe amenities at the Inn. If you are dreaming of a ceremony with all of your family and friends, we also have an Intimate Wedding Package available to accommodate up to 40 guests. The beauty of weddings is that your love story is only just beginning. So why not extend your stay and spend your honeymoon in Monterey as well? Our charming Inn is the perfect place to spend some quality private time with one another and celebrate this joyous occasion with one of our many romantic packages. 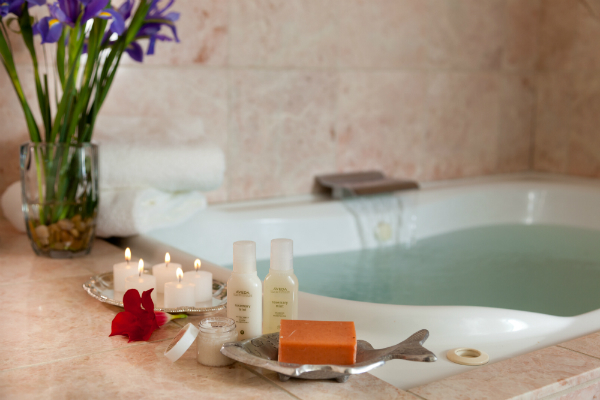 Whether you’re drinking wine by the cozy fireplaces, strolling through the sweet-smelling gardens, admiring the starry sky from the private balcony, or indulging in a relaxing massage treatment in our private spa, we guarantee that the opportunities for romantic here are endless. If you can tear yourself away from your suite, you are sure to find even more adventures nearby. Monterey has many local vineyards, stunning shores, and state reserves where you can make fun memories that will last for a lifetime. 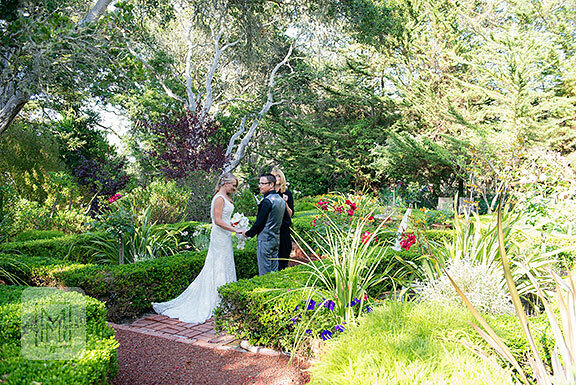 So if you are looking for an enchanting wedding day, join us at Old Monterey Inn, where romance, elegance, and charm combine to create the day of your dreams. The weather right now is perfect for a gorgeous summer wedding outside in our beautiful gardens. The crisp air in the fall also makes for a great autumn wedding with a vibrant array of warm colors painting the garden. If you would like to celebrate your love here or want more information, fill out this form and we will get back to you! It’s that time of year! Summer in Monterey means endless things to do and see. Whether you’re coming out to experience one of the many events or just feel like getting away to a beautiful summer destination, we have you covered. Check out our ideal 3-day summer itinerary for inspiration and book your Monterey getaway today!